A Monteith man has been fined $3,000 and received a two-year fishing suspension for possessing an over-limit of walleye. Daniel P. Cyr pleaded guilty to possessing 19 walleye over his legal limit. Court heard that on June 9, 2013 a conservation officer inspected two individuals coming off the Abitibi river system at the Twin Falls boat launch in Teefy Township. At the time, one pike was presented to the officer. Upon further inspection of a cooler, 46 walleye fillets (23 walleye) were found in two plastic bags. The possession limit for walleye in that area is four. Justice of the Peace Jean Marie Blier heard the case in the Ontario Court of Justice, Cochrane, on August 8, 2013. The Ministry of Natural Resources reminds anglers that possession limits are in place to ensure the sustainability of fishery resources. For further information about fishing regulations, please consult the 2013 Recreational Fishing Regulations Summary available at ontario.ca/fishing. 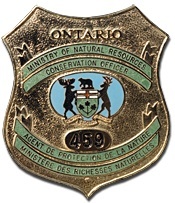 To report a natural resource violation, call 1-877-TIPS-MNR (847-7667) toll-free anytime or contact your local ministry office during regular business hours.